From the perfect event submission, thanks, Gynae! department... The Hip Hop Theater Explosion... It's at the Vortex Theater, 2307 Manor Rd., starting Thursday @ 8pm. It will also run Friday and Saturday, same time. This event takes hip hop out of the club and onto a stage, in an intimate setting you wouldn't ordinarily expect to find real hip hop. SaulPaul, Public Offenders, Blacklisted Individuals, S.T.A.T.I.K., Under 21 Slam Poetry team members, breakdancers on skates - it goes on and on! Hosted by Zell Miller III, you can name your own ticket price starting at $5, all donations go back to the artists who are performing for the love of the culture. He’s given us My Child, My Child, My Alien Child and followed it with B-Boy Bluez. So what does Zell Miller III have up his sleeves this summer at the Vortex? Breakdancers on skates, champion poets, hip hop musicians, and so much more. 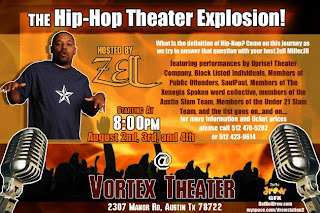 It’s The Hip Hop Theater Explosion starting this Thursday at 8 pm. Packed with amazing hip hop performers, it will take three whole nights to watch them all! This year, Miller’s show is for more than just entertainment. It’s about forming relationships, building a stronger community, and putting Austin hip hop under a different kind of spotlight - all in classic Miller style. By blending his love for hip hop culture with his passion for theater arts, Miller hopes other theaters will join in the phenomenon exploding around the country. Hip Hop Theater itself is not a new “trend” in the theater circuit. Danny Hoch and Will Power are two pioneers responsible for bringing hip hop out of the club and onto the stage. An actor, playwright and director, Hoch (dannyhoch.com) founded the Hip-Hop Theater Festival in 2000 and has received numerous awards for his work, such as the Sundance Writers Fellowship and two OBIES. Power (willpower.tv), also an actor and playwright, rapper and educator, performs an internationally-acclaimed solo show entitled, “FLOW,” that combines his original music, rhyming, and hip hop choreography. His awards include the 2006 Peter Zeisler Memorial Award, 2004 Jury Award for Best Theatre Performance at the HBO Comedy Arts Festival, and the NYFA Fellowship, among others. It’s also a showcase of the talent Miller has inspired through his many poetry/workshops and volunteer mentoring sessions. One such performer is Jeffery Johnson Jr. He met Miller at a play audition when he was 14-years-old. Currently representing the city of Austin in the 2007 National Poetry Slam, Johnson helps kids at Lifeworks, a non-profit social services agency. As Da’Shade Moonbeam, he’s also one half of hip hop duo Blacklisted Individuals, who are in the running for the $10,000 prize on Famecast.com. Education being an important function of hip hop culture, Johnson took what he learned from Miller and passed the torch along to Chris Floyd. They met at one of Miller’s workshops at Reagan High School two years ago. Floyd recently returned from Brazil as part of an international cultural exchange program. Performing Thursday as Gator of four-man crew Public Offenders, the 21-year-old has taught workshops on how to use spoken word as a way to motivate teens and is also an instructor at the 21st Century After School program. Miller has a budget of $0 for the show, but knows the performers are doing it for the love of the culture. It also provides the hip hop community with an opportunity to gather under unique circumstances in a different space. Along with several vendors, the three-night event will be bringing people together that might not have had the chance to meet. “Anybody creating work, whether graf writing, breakdancing, or DJ-ing, all that can be turned into theater,” explains Miller. For those that prefer to appreciate hip hop from a comfy theater seat and on stage, this show is for you. For those in the hip hop community, it’s added proof of the culture’s reach and impact on today’s generation. This hip hop theater piece is for the whole family and you can even pick your own ticket price, starting at $10. All donations will go toward paying back the artists.